AM I PREPARED FOR THE DIGITAL TRANSITION? Which DTV stations will to be carried on my system? The current UHF channel DTV allocations, and the future changes coming after February 17, 2009? 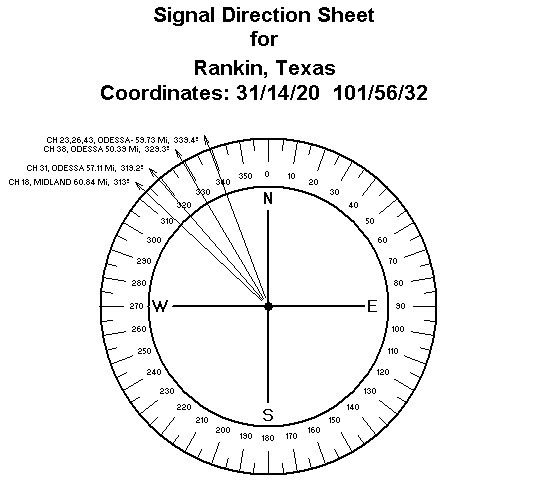 The complete information about the stations' distances and their directions (Azimuth Angles)? The difference between specified and actual confirmed data on digital output power and polarization? Whether co-channel and adjacent channel interference protection was considered when ordering antennas and antenna-arrays? If the antenna bill of materials for the reception of the desired stations is unbiased? Antenna manufacturers will consider only their own antennas, which may not be the best or the most economical for DTV reception. The very first thing you need todo is to collect information on all DTV stations within a 100 mile radius, in increasing distance order, including output power and transmit antenna height, as well as computer calculated distances and directions. The first section of the Computer Aided Recption Study below, the “Computer Run”, shows COMPLETE TECHNICAL INFORMATION. 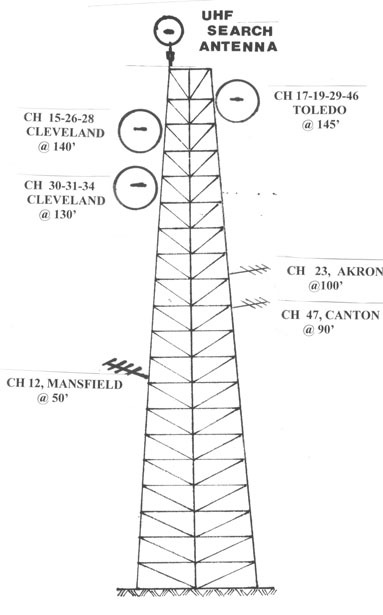 This study should be followed up by a simple visualization of the distances and directions of the desired stations to see whether multiple DTV stations can be received with a single antenna, the "Signal Direction Sheet". Many VHF analog stations have decided to retain their legacy channel allocations which have been there since the 1950s. This meansthat today they are effectively broadcasting DTV programming on a TEST channel, and will abruptly turn off this secondary UHF DTV transmitter and change the format of the original well established analog channel to DTV. Finally, just to add some more confusion ot the mix, the 700 to 800 MHz frequency range must be vacated as well, forcing all Channel 52 to Channel 69 analog UHF stations to be reassigned to new frequencies. The problem is that while the switchover will occur only on February 17, 2009, the tower must be ready for the digital transition with the new antennas/antenna-arrays in the correct position. The Biro DTV reception study will list the proper antennas, with the antenna-tower design displaying their desired locations on the tower. If a station wants to be carried successfully on a distant Cable TV system, it has two choices: either petition the FCC to reconsider the power limitation, or abandon the VHF channel which was acquired in the 1950s in order to transmit a much higher output on a UHF channel. Unfortunately, the higher UHF frequencies perform poorly in areas where DTV signals must travel great distances over hilly terrain or suffer multipath reception. For analog stations these impairments may cause annoying ghosting and noisy pictures. Marginal DTV signal levels can still deliver perfect pictures or no pictures at all: the digital waterfall effect. There is absolutely no middle ground. To iron out Digital Transition concerns before the February, 2009, nationwide analog shutoff, the FCC authorized DTV tests in a number of metropolitan areas, such as Sacramento, CA, Philadelphia, PA, and Milwaukee, WI. Selected stations suspended regular analog broadcasts for 60 seconds, allowing CATV technicians to conduct DTV verification testing. If you have DTV reception studies on hand, the survey team will be much better prepared for the verification testing as well for the evaluation of the test results. Outdoor surverys in Decembers might not be ideal, but those conditions will be a lot friendlier than emergency action in the middle of a February snowstorm. The next three months present a final opportunity to rethink and rebuild. The time to void costly mistakes now. If that’s what you have in mind, the specialized technical services of Biro Engineering can help you with studies, designs, or consultation to meet the Digital Transition deadline and save money in the long run.